Free WiFi and power outlets are available on the bus, so you can share your journeys with loved ones at home! Top notch to Yokoso Travel tour company. Our tour guide Natsumi she made is very friendly and funny during her presentation. Let"s not forget our driver Mr. TanakaHe has been so nice and patient waiting for our group to board the bus. It has been a nice weather yesterday. My daughter and I had a marvellous time at Odawara Castle, Hakone pirate ship and Minami Skywalk. Our Lunch was great and had seafood. Thanks again Klook. Get out of the tangle and the hectic pace of the city and head to the scenic views out at Mishima. 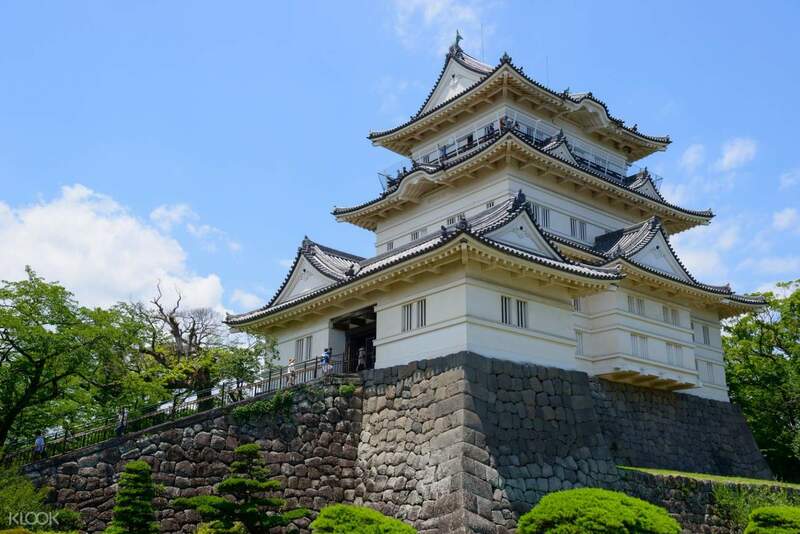 Departing from Tokyo, your first destination outside of the city is the majestic Odawara Castle, a famous stronghold in history and the castle that had dominated Mishima for generations. 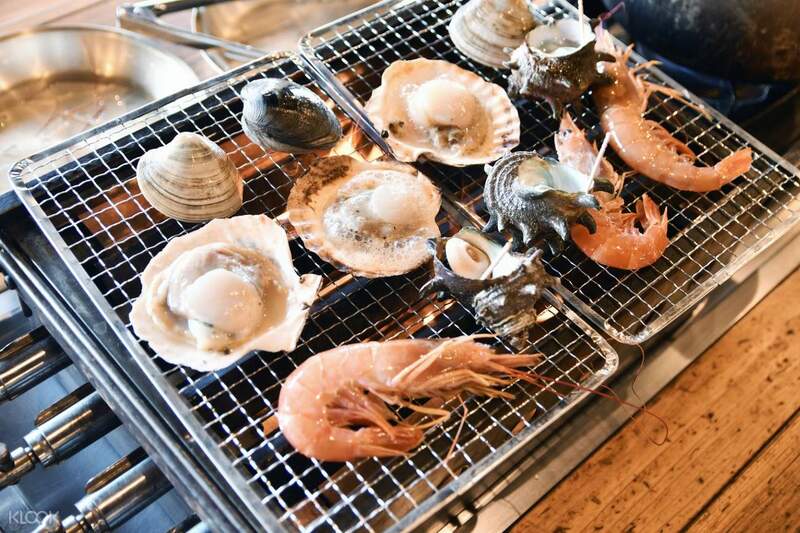 This is followed by a delicious seafood lunch at the Odawara Kayakawa Gyoson where fresh and scrumptious seafood right out of the water is grilled to perfection right at your table. Soon after, you head to Motohakone Port at Lake Ashi, where you will step aboard a magnificent pirate ship! Rides on the Hakone Pirate Ships are a famous attraction in the area, as all three ships had been carefully designed, with luxurious interiors and even a cafe and restaurant on board. 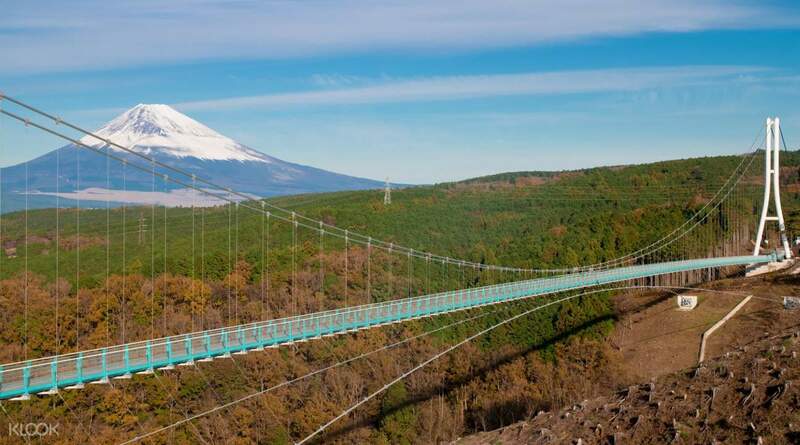 Upon arriving at Togendai Port, you will make your way to the world famous suspension bridge, the Mishima Skywalk, stretching over the expanse of a glorious valley filled with lush natural greenery. To the backdrop of the valley, you'll sight grand Mt. Fuji itself. The Skywalk offers some of the most beautiful views of the mountain, allowing you to capture that perfect photograph to keep in your memories forever. You will return safely back to Shinjuku at the end of your tour. A fresh, perfectly grilled all-you-can-eat seafood buffet is waiting! 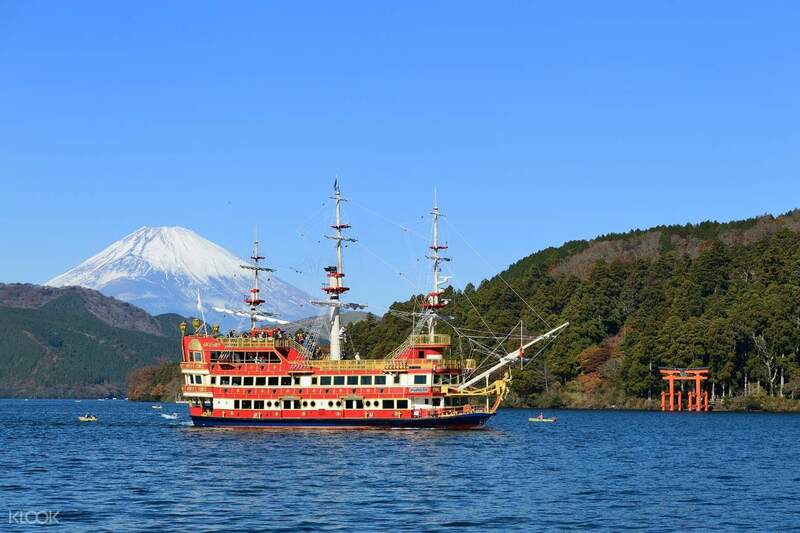 Go on a cruise over Lake Ashi on the Hakone Pirate Ship! Top notch to Yokoso Travel tour company. Our tour guide Natsumi she made is very friendly and funny during her presentation. Let"s not forget our driver Mr. TanakaHe has been so nice and patient waiting for our group to board the bus. It has been a nice weather yesterday. My daughter and I had a marvellous time at Odawara Castle, Hakone pirate ship and Minami Skywalk. Our Lunch was great and had seafood. Thanks again Klook. Top notch to Yokoso Travel tour company. Our tour guide Natsumi she made is very friendly and funny during her presentation. Let"s not forget our driver Mr. TanakaHe has been so nice and patient waiting for our group to board the bus. It has been a nice weather yesterday. My daughter and I had a marvellous time at Odawara Castle, Hakone pirate ship and Minami Skywalk. Our Lunch was great and had seafood. Thanks again Klook. This tour was great. The seafood lunch was superb, everything's fresh and oishi! 1hr is not enough though to really indulge hehe. The Hakone Pirate Ship was ok too,was too packed though but it was ok for a short cruise. The Skywalk was great too bad Mt Fuji had been so shy and only managed to see 1/8 of her :(. I have tries the black boiled egg too and it's umai! what made this tour so amazing are the tour guides/tour directors Ms Kon Shino & Mr Masafumi Miyoshi have been so warm and accommodating and ki nd and so patient and pleasant. And even the driver/bus cqptain Mr Naito had rendered a great service. Loved the game Miyoshi-san made thru our journey back to Shinjuku. It was fun. Ms Kon Shino was so kind enough to offer and helped me to book for my airport limo bus to the airport when I only asked her on how to get to the airport limo ofc in Shinjuku. She is amazing. All of them were. Good job guys! This tour was great. The seafood lunch was superb, everything's fresh and oishi! 1hr is not enough though to really indulge hehe. The Hakone Pirate Ship was ok too,was too packed though but it was ok for a short cruise. The Skywalk was great too bad Mt Fuji had been so shy and only managed to see 1/8 of her :(. I have tries the black boiled egg too and it's umai! what made this tour so amazing are the tour guides/tour directors Ms Kon Shino & Mr Masafumi Miyoshi have been so warm and accommodating and ki nd and so patient and pleasant. And even the driver/bus cqptain Mr Naito had rendered a great service. Loved the game Miyoshi-san made thru our journey back to Shinjuku. It was fun. Ms Kon Shino was so kind enough to offer and helped me to book for my airport limo bus to the airport when I only asked her on how to get to the airport limo ofc in Shinjuku. She is amazing. All of them were. Good job guys! The overall tour is very good and we didn’t have any problems during that day. The weather is very beautiful and you can see cleary the Mt. Fuji. The unlimited seafood for lunch is very delicious. The ship ride is very nice also, so cold on Lake Ashi, you can stay inside the ship but we stay outside to feel the cold weather. And lastly, our tour guide Ms. Kyoko is very accomodating, she will help you on everything that you need, she is so very kind. Will be back soon again in Japan. The overall tour is very good and we didn’t have any problems during that day. The weather is very beautiful and you can see cleary the Mt. Fuji. The unlimited seafood for lunch is very delicious. The ship ride is very nice also, so cold on Lake Ashi, you can stay inside the ship but we stay outside to feel the cold weather. And lastly, our tour guide Ms. Kyoko is very accomodating, she will help you on everything that you need, she is so very kind. Will be back soon again in Japan. For those travelling therefor the first time or wanted to see the tourist areas with the least fuss as possible, this is the perfect tour for you. Despite there’s no tour guide, the tour attendant is able to provide information about the area and the journey there. Enough time to wander around the area. The buffet itself is definitely a overwhelming feast if you like shellfish and seafood (also skewers too!). Surprise by the little draw at the end of the tour and able to drop us back to the stop that’s closer to the hotel. Ensure you find out which stop they’re picking you up from. For those travelling therefor the first time or wanted to see the tourist areas with the least fuss as possible, this is the perfect tour for you. Despite there’s no tour guide, the tour attendant is able to provide information about the area and the journey there. Enough time to wander around the area. The buffet itself is definitely a overwhelming feast if you like shellfish and seafood (also skewers too!). Surprise by the little draw at the end of the tour and able to drop us back to the stop that’s closer to the hotel. Ensure you find out which stop they’re picking you up from. The weather happened to be really bright and beautiful on 22 Oct! We got to experience some really awesome views of Mt Fuji that day. We all liked the Mishima Sky Walk and the pirate ship ride. I selected this tour as I felt it would be a more pleasant way to see Mt Fuji than to jostle with crowds at the typical Mt Fuji Hakone tours. More time could have been given for the time at Mishima. The buffet seafood BBQ was a hit with my family! Again, we thought 1 hour was a little too rush to really enjoy the meal. Overall, we had a wonderful time and highly recommend this tour! The weather happened to be really bright and beautiful on 22 Oct! We got to experience some really awesome views of Mt Fuji that day. We all liked the Mishima Sky Walk and the pirate ship ride. I selected this tour as I felt it would be a more pleasant way to see Mt Fuji than to jostle with crowds at the typical Mt Fuji Hakone tours. More time could have been given for the time at Mishima. The buffet seafood BBQ was a hit with my family! Again, we thought 1 hour was a little too rush to really enjoy the meal. Overall, we had a wonderful time and highly recommend this tour! Interesting tour, good quality and tasty seafood lunch. Enough time to enjoy every place in the itinerary. Interesting tour, good quality and tasty seafood lunch. Enough time to enjoy every place in the itinerary. the tour was interesting and fun but as it was a bit cloudy we couldn't really see mt Fuji clearly. however in the morning during our ride down, we were able to see mt Fuji from a distance. tour guide was super friendly and nice. even had a mini lucky draw during our bus ride back to shinjuku. lunch was okay but if you're a seafood lover you will love the lunch. the tour was interesting and fun but as it was a bit cloudy we couldn't really see mt Fuji clearly. however in the morning during our ride down, we were able to see mt Fuji from a distance. tour guide was super friendly and nice. even had a mini lucky draw during our bus ride back to shinjuku. lunch was okay but if you're a seafood lover you will love the lunch. Best tour guides and driver who always thought of their group members. Chiaki even played games with the group and gave out prizes and souveniers for all. Thank you! Best tour guides and driver who always thought of their group members. Chiaki even played games with the group and gave out prizes and souveniers for all. Thank you!